As real country pumpkins, we don’t often spend time in big cities. When looking at a map and planning our next trip, we usually pick mountainous regions as our destinations of choice. However, sometimes we like to do brief immersion in the concrete jungles, as they really provide a break from the everyday and a quick culture fix for the outdoor adventurers that we are. 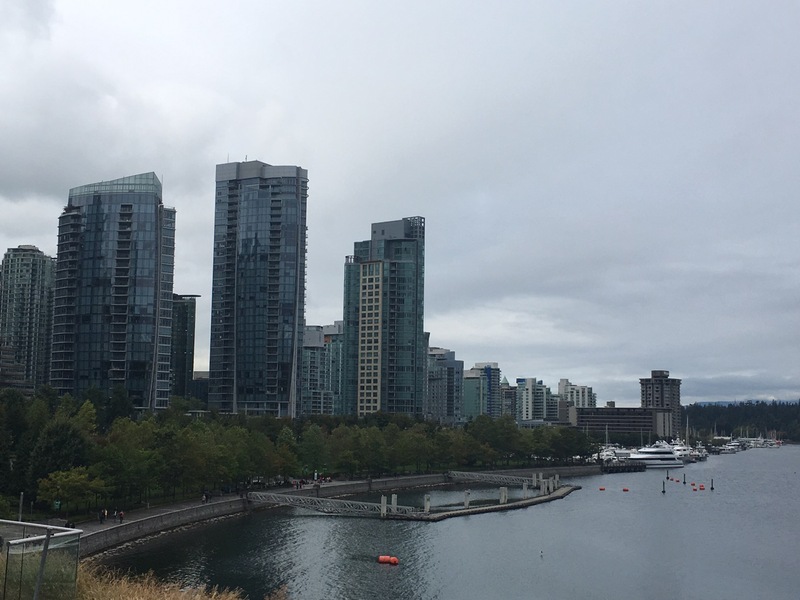 Lately, we chose to layover in Vancouver for 24 hours to see what the glass city was really about and get a preview taste of the West Coast. A great traveling tip I discovered lately is that when booking a flight on points (we collect aeroplans), it usually doesn’t cost more to book a multi-city trip. This is exactly what we decided to do, on our way between Cranbrook and Quebec City. 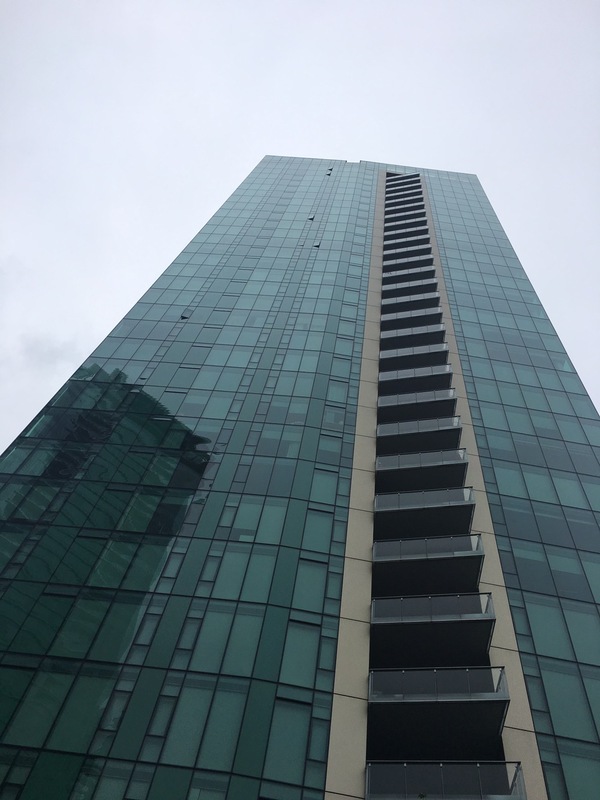 Sleeping in and waking up in a high-rise hotel room really started our express stay on a good note. 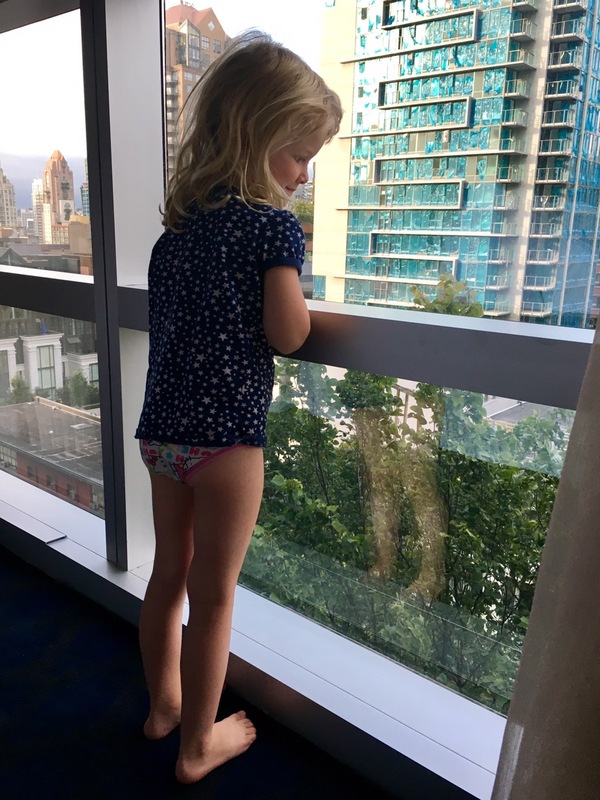 At age 4, I don’t think my daughter had ever seen a building taller than 4 storeys. Watching cartoons in bed all curled up with too many pillows was definitely one of her personal highlights. Out on the street on this cool summer morning, which was a nice break from the intense heat we had experienced in the Interior all summer, we wandered to get some coffee and breakfast at a nearby café. If eating out is a treat we don’t indulge in often at home, in the city, it is one of our most decadent pleasure. The good news was that we had three meals ahead of us to enjoy Vancouver’s food! We found some delicious breakfast sandwiches and good lattes (for $3.50!) at the Cafe Restaurant Mangez, Mangez on Melville St.
All geared up with fancy townies, crossed the bridge and took a left toward Grandville Island and it’s enormous urban market. On a weekday in August, the place was packed with people and cars. We were glad to be on two-wheels as bike parking was much easier to find, and cheaper also. On Grandville Island, there is so much to see, smell and taste! 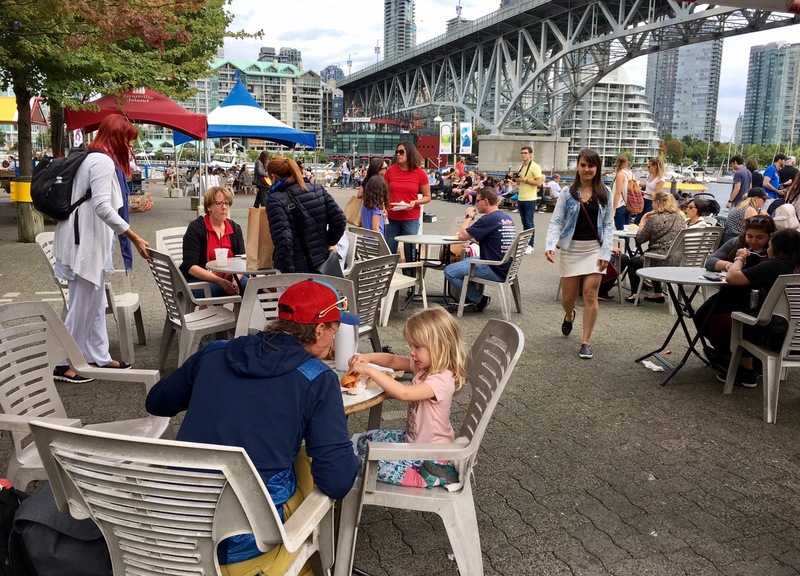 From the various artisans from all over British Columbia to craft beer, any type of food vendors one could dream of to seafood restaurants and garden shops, the place is buzzing with life, with reason. For the shoppers at heart, the Kid’s Market is the place to hit for children clothing, shoes, toys & games, books and even specialized haircuts! A dangerous place to take a toddler in my opinion as you can’t go in without buying something for your little angels. At the “adult” market, I didn’t have enough of my two eyes to take in all the beautiful jewelry, pottery, artisan bread and fresh produce, while my husband and daughter happily chased away the hungry pigeons out on the waterfront. We elbowed a few people to find a table to sit down and eat. After our meal, we hopped back onto our bikes. By then our daughter was ready to doze off for a nap so we made her a cozy little bed in the bike trailer and we aimed toward the Seawall in the direction of Stanley Park. 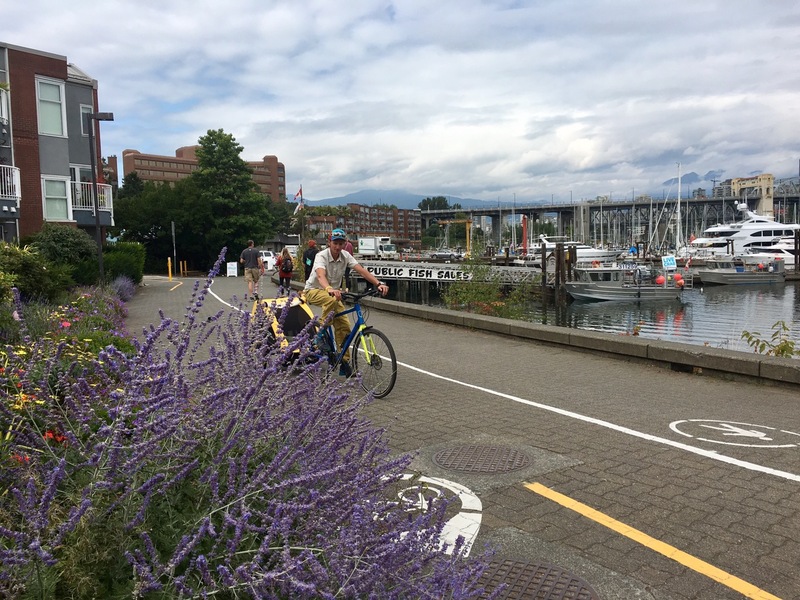 The cycling path network in Vancouver is impressive. By riding along the ocean tucked between the beach and the skyscrapers is really when you get to feel how special Vancouver is. This big cosmopolitan city of 2.5M souls transpires a mix or urban, ocean and mountain cultures and lifestyles. 289 km of paved trails take the explorers looking for an easy, fresh, affordable and ecological way to explore the city from parks to beaches and from landmarks to attractions. The most scenic part, the Seawall is comprised of 28 km of seaside greenway for walking, biking and roller skating. Within a half hour of pedaling, we reached the entrance of Stanley Park where we had to duck around a few fat geese feasting by a small pond. Named for 1888 Governor of Canada Lord Frederic Stanley, the park covers 405 hectares of green space almost entirely surrounded by water. Home to the gigantic douglas fir trees and to the Vancouver Aquarium, this park is my favourite attraction in Vancouver and was voted best park in the world by Tripadvisor in 2014! Twenty minutes later, after a quick look at the Totem Poles, we reached the bridge and the entrance to the harbour. Fishermen were going about their business with their oversize net and large buckets filled with small fish. Right around that time, my daughter woke up from her nap just in time to catch a glimpse of the Inukshuk beach. We set the bikes aside and added our own to the impressive number of small rock towers and watched the teeny-tiny crabs in the tide pools. One kilometre down the path, we stopped at Third Beach for a toe-dip just as the clouds cleared and the sun came out. 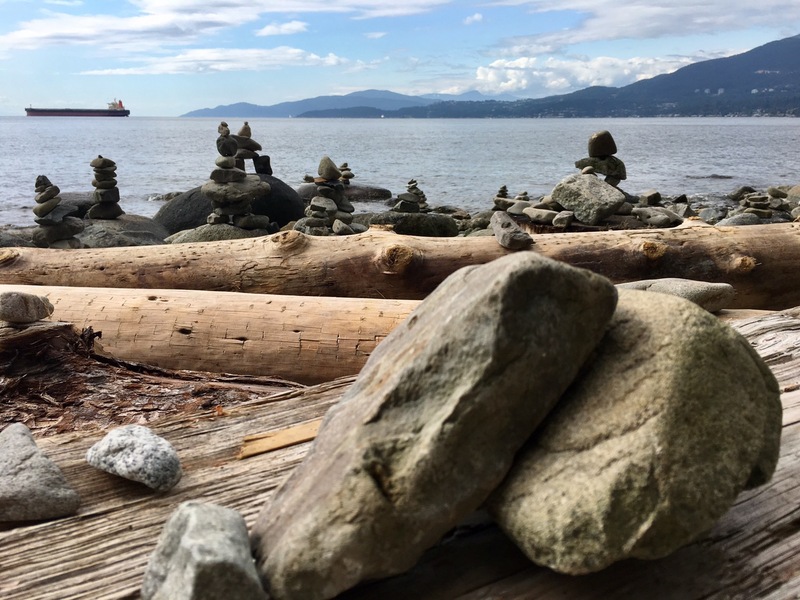 Playing in the fine sand and watching the cargo ships isn’t something we get to enjoy often in our beloved Kootenays so we took full advantage of it. A little further down, we came across the kids spay park and stopped for well-deserved ice cream and berries at the beach concession. A short stop at the playground and our way out the Park and we slowly made our way back to the bike shop. All that pedaling had made us thirsty! 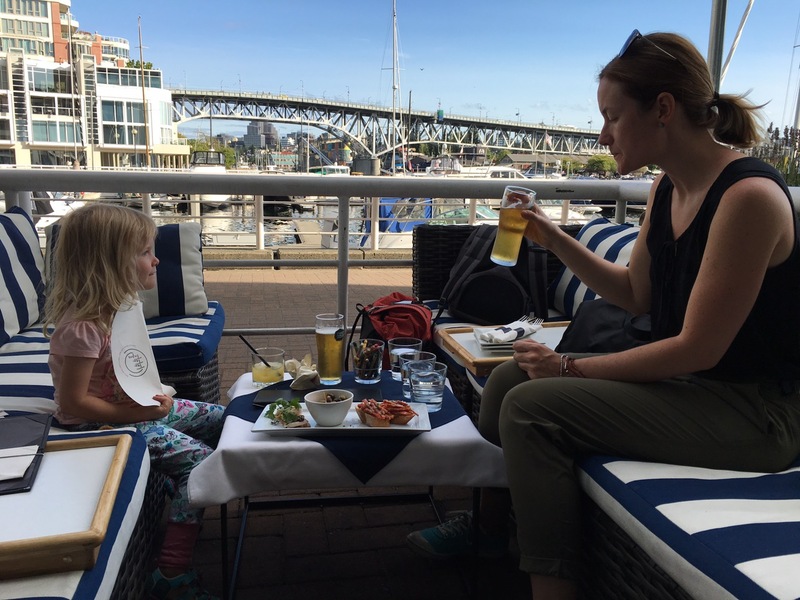 We landed for happy hour, French-Riviera style near the Burrard Bridge marina at Ten Ten Tapas where we enjoyed a glass of craft beer from Stanley Park and a few appies while looking at the luxury yacht docked nearby. We couldn’t spend a day in Vancouver without tasting Asian food of some kind. 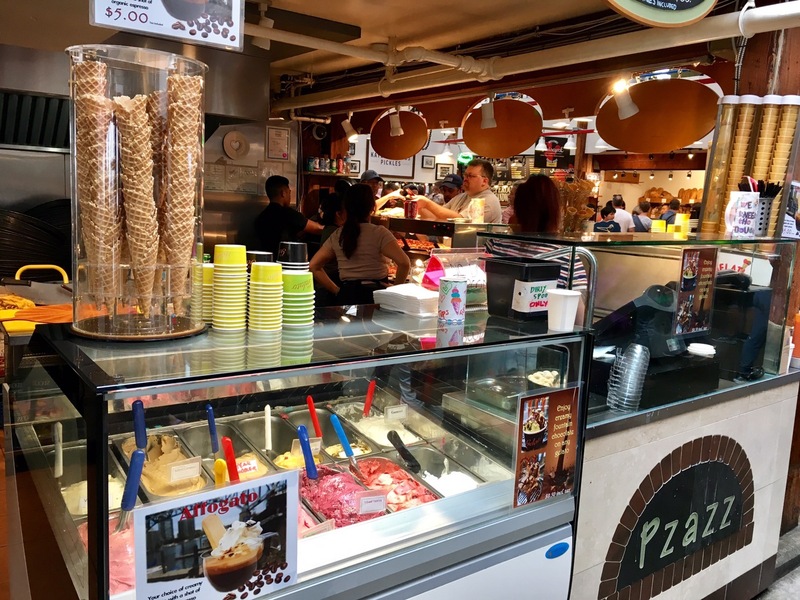 In this multi-ethnic city, where approximately 36% of the population is from east and south Asia, locals and visitors can enjoy the best selection of Asian cuisine east of the Pacific. One wouldn’t have enough of a full year of eating breakfast, lunch and dinner out to nearly cover all the Asian restaurants there are in the city. 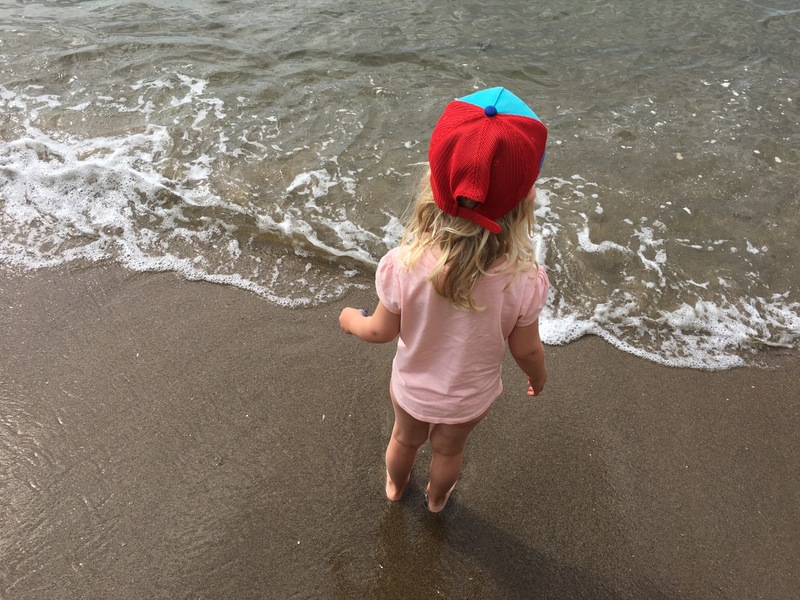 We gave our 4-year old the choice of what to eat for dinner…unsurprisingly, she picked sushi! After our feast, it was time to head back to the Sheraton to pick up our bags and slowly make our way to YVR airport where the start of a new adventure awaited. Those 24 hours spent in Vancouver had left us with the salt on our skin, sand in our shoes and plenty of West Coast images in our heads.